Installing Google Earth in Ubuntu 11.04 turned out to be as easy as downloading the latest version from here and double-clicking it, but not until I had already tried to download the source and build an install package manually. I'm not sure how this would have worked, but I gave up when Ubuntu barked that it was a "bad package" and instead of continuing on, I decided to look for an official package instead. I had, by that time already installed lsb-core though, and I don't know which version I had or if that matters. The first time Google Earth ran, the fonts looked terrible. This is a common problem (and I've had it before on other Linux installs, but installing the core Microsoft fonts package fixed up the problem immediately. Once trying to use the program I noticed that it was running really slow, pausing every few seconds or so, basically unusable. I got kinda worried that maybe I wasn't set up to use my Intel on-board graphics card correctly (that maybe I needed to use a different driver) and started poking around. Armagetron, another program I run that needs serious graphics horsepower runs fine though. glxgears gave me just under 60fps which seemed really low but was suspiciously exactly the frequency of the monitor so perhaps thats just a red herring. I was starting to get discouraged when I noticed I had a bunch of updates to do. I did those and rebooted and Google Earth was running as slick as ever (glxgears fps numbers didn't improve). Not sure if something got updated that needed to be, or if I really just needed to reboot after installing lsb-core or google earth itself. 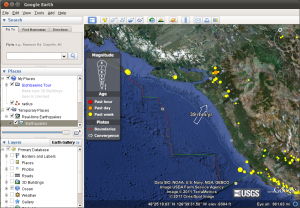 So I started poking around for cool things to do in Google Earth and came across: USGS Real-Time Earthquakes KML which is just so Geo-geek awesome I had to share.